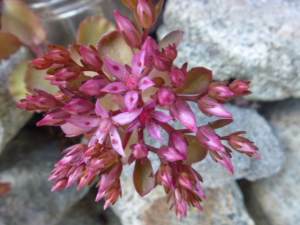 Sedum spurium ‘Fuldaglut’ otherwise known as ‘Fireglow’ is another dark red creeping form of two row stonecrop. The butterflies and bees sure enjoyed this one, among others that bloomed at the same time, or soon after. I definitely recommend this one for the butterfly garden. Very hardy and drought resistant, it’s almost indistinguishable from ‘Dragon’s Blood’, and in fact, some sources list them as the same plant. I’m not sure that they are the same, as at certain times of the year they seem to be either more green or more red. Best used in rockeries and containers in combination with other varieties and species of Sedum, although is also recommended for use on green roofs and Sedum tapestry beds.